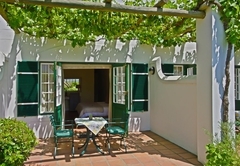 Eikendal Lodge is a 4 star graded B&B offering Stellenbosch accommodation in 9 guest rooms. 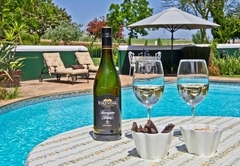 Treat yourself to an authentic Cape Winelands experience, blended with superior wines and true hospitality! 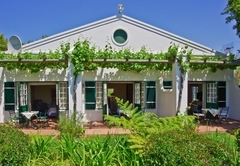 Eikendal Lodge is uniquely situated amidst prized vineyards and a working winery near Stellenbosch. 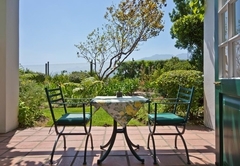 The property also offers a wide range of activities, from grape picking to a fly fishing clinic with experienced professionals. 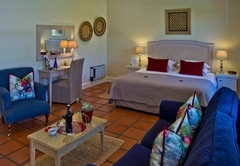 Eikendal Lodge offers an idyllic Winelands retreat, and comprise of nine spacious, en-suite bedrooms. 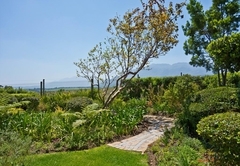 Each room has a private terrace opening directly onto amazing, panoramic views of the Helderberg Mountain, our beautiful garden and lusciuos vineyards of Eikendal. 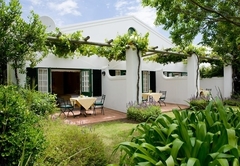 Guests can relish a hearty meal at the resident A-la Carte Restaurant situated in the cellar, a mere 15 min walk from the Lodge. 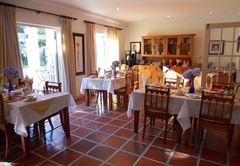 The Eikendal Restaurant is open for lunch and dinner from Tuesday to Saturday. Should you wish to stay in for the night, you may choose to order from our A-la Carte menu, and enjoy a lovely meal as room service, outside on your terrace, under the stars! 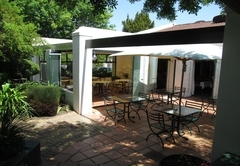 The Eikendal conference centre situated adjacent to the restaurant seats up to 60 participants and is ideally suited for workshops, conferences and private functions. 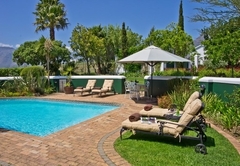 The area is perfect for the Golf enthusiast who would like to experience some of South Africa's most prestigious courses. 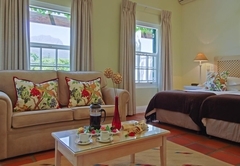 Other activities available include hiking in the vineyards and mountains, whale watching (seasonal), shopping at the famous Waterfront in Cape Town and much more. 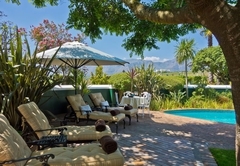 Eikendal Lodge sets itself apart with its unique, serene setting, offering the best of both worlds with daily wine tastings and enlightening tours through the renowned Eikendal cellar. 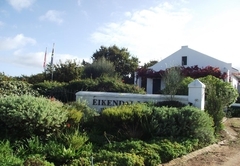 Eikendal's modernised tasting facility and friendly team, provide you with the ideal opportunity to sample the range of award winning wines, seven days per week. Visit our barrel-vaulted cellar building for an informative tour, and the opportunity to meet our wine maker. A unique bonus for guests at harvest-time is a chance to participate in the grape-picking and thereafter to see at close quarters "your" grapes beginning their journey towards our award-winning wines in the pressing cellar, under the guidance of our wine makers. 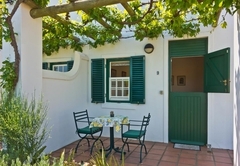 The excellent quality of wines and the spectacular landscape make Eikendal a worthwhile point of call whilst visiting the Cape Winelands. 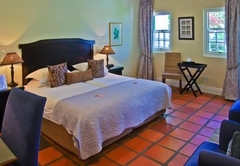 En-suite room with shower and king-size bed . 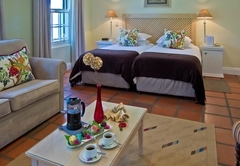 Air-conditioner, safe, kettle, tea/coffee, mini fridge, hair-dryer, telephone, German & sattellite TV, bathroom amenities, towels, linen and private terrace. 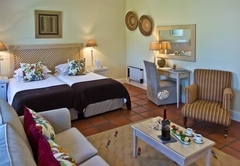 En-suite room with shower and twin beds . Air-conditioner, safe, kettle, tea/coffee, mini fridge, hair-dryer, telephone, German & sattellite TV, bathroom amenities, towels, linen and private terrace. 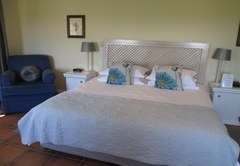 En-suite rooms with bath & separate shower, and king-size bed. 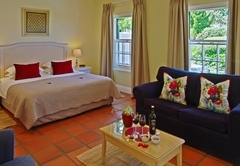 Air-conditioner, safe, kettle, tea/coffee, mini fridge, hair-dryer, telephone, German & sattellite TV, bathroom amenities, towels, linen and private terrace. 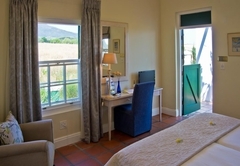 En-suite rooms with walk-in shower (no bath), and king-size bed. Air-conditioner, safe, kettle, tea/coffee, mini fridge, hair-dryer, telephone, German & sattellite TV, bathroom amenities, towels, linen and private terrace. 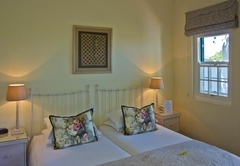 En-suite rooms with shower and offering twin beds. 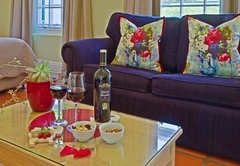 Air-conditioner, safe, kettle, tea/coffee, mini fridge, hair-dryer, telephone, German & sattellite TV, bathroom amenities, towels, linen and private terrace. 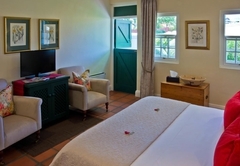 En-suite rooms with walk-in shower (no bath), and twin beds. 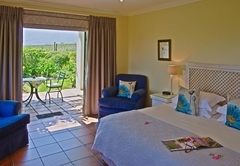 Air-conditioner, safe, kettle, tea/coffee, mini fridge, hair-dryer, telephone, German & sattellite TV, bathroom amenities, towels, linen and private terrace. 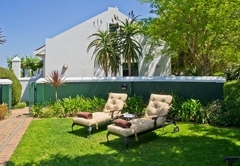 289 Reviews from SA-Venues.com travellers. All reviews are verified. We had a marvellous time here. The staff was incredible. Thank you – hope to see you again!!! Response timeEikendal Lodge typically responds to requests in 5-10 minutes. 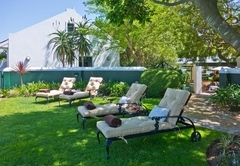 Exceptions to check-in/out times during Low Season may be arranged, please enquire.